Of course, small trees or bushy shrubs can perform a similar role, but they do usually need a fair amount of soil in which to spread their root systems. 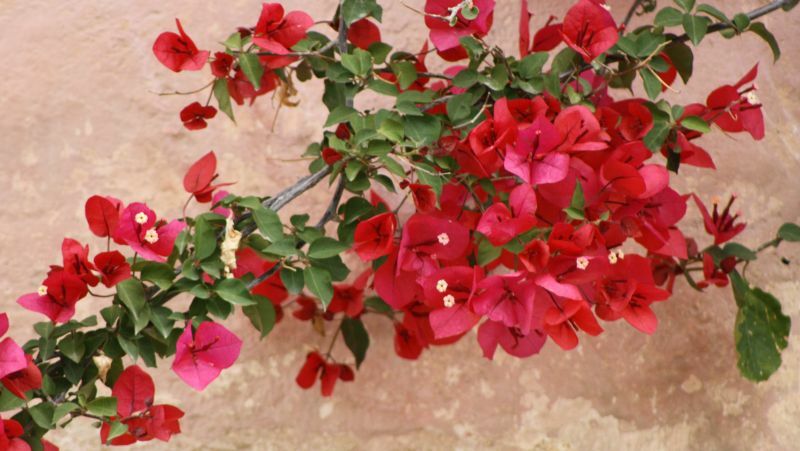 A few co­lumnar foliage shrubs might do the trick; for instance the plant Thais refer to as cristina with reddish, young foliage, or dense, evergreen sai. Cristina is al­most always seen here as a neat hedge or geometrical form and is remarkably tolerant of heavy clipping and shaping. But vines generally offer the best backdrop. They certainly have several advantages over trees: they tend to hug walls – indeed many are self-clinging and will climb ever higher in search of sunlight. And al­though grape vines have notoriously deep roots with a maximum of six metres or more, most climbing plants do not require as much soil in which to thrive as shrubs or trees that possess a comparable density of leaf growth. After all, hanging on to exist­ing supports does not expend nearly so much energy as their hosts are expend­ing to create a rigid, woody framework. Moreover, you can grow climbers in two ways: use them from the ground upward (the usual method); or, where the walls are effectively terraces with the gardens behind abutting the sum­mits of these retaining structures, the vines can be planted on top and allowed to cascade gracefully down. Oddly bou­gainvillea – that maid of all work – has been employed in this capacity in one garden I know, with the result that the view along the road below is embellished with masses of pink, white and crimson blooms. Other climbers that can trail and help soften the man-made outlines might include the shower orchid (con­gea tomentosa) which has a naturally dangling habit and blooms profusely on long, thin, pendant branches during the winter months. The strings of flowers are lavender in colour – hence its popu­lar name of lavender wreath. It is native to Thailand, enjoys the full sun that the climate provides and can, like bougain­villea, be grown in almost any soil type provided it gets sufficient moisture. Thunbergia grandiflora (blue trum­pet vine) is anther sensible choice, a robust member of a large genus of flow­ering climbers with heart-shaped leaves and long, hanging clusters of mauve or white trumpet-shaped blooms. Easy to grow, it likes sun or filtered shade. Other vines are climbers pure and simple. 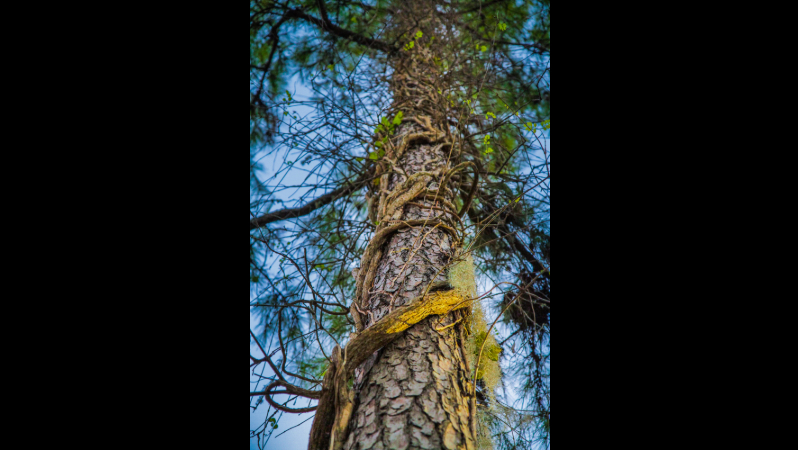 The real experts – known as lia­nas in the rainforests – are self-clinging with tendrils or modified leaves which can attach themselves to any structure, natural or man-made, that happens to be within reach. Indeed the wild varie­ties can be a handful, swarming all over canopy trees and in some cases stran­gling them. Cultivated varieties are less invasive, but my garlic vine (mansoa alliacea), an ornamental evergreen, semi-woody vine, has wound itself around an adjacent tree in my garden and is now covering the upper branches with blossom. Ex­tremely vigorous, this garlic vine has attractive lavender or deep pink blooms with a white throat which fade to a paler colour as they mature. Naturally there are many other climber candidates: antigonon (coral vine), argyreia (elephant creeper) and pyrostegia (flame vine), all of which inch upwards by means of tendrils. But they will have to wait their turn to grab the limelight.